Did you spot any Avengers this month? Or Clint Eastwood? Another month has passed and a whole bunch of new film and TV productions are under way here in the Hollywood of the South. Our almost daily tropical rainstorms might be hindering outdoor shoots, and the heat certainly doesn’t help, but you still can’t take three steps without almost wandering into a basecamp. 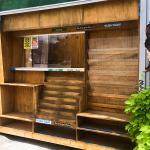 Here’s what we saw around town. 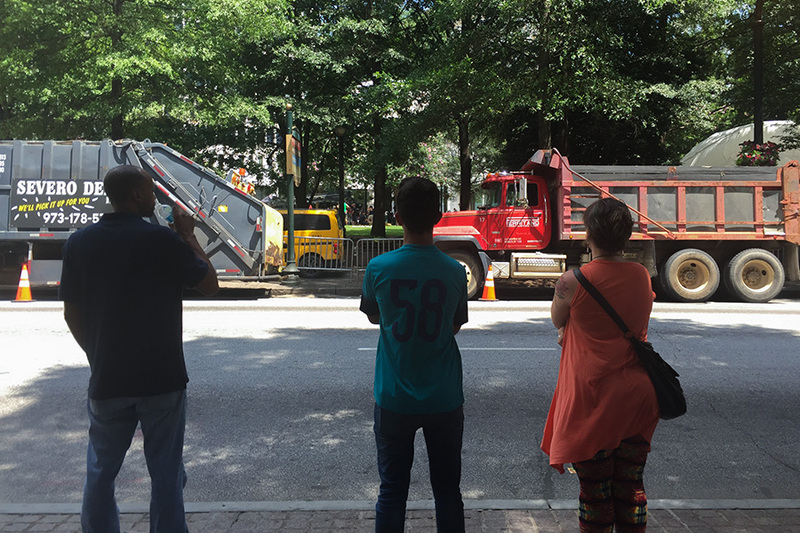 Onlookers watch as crews film a scene for Avengers: Infinity War in Woodruff Park. Marvel’s Avengers: Infinity War (FIGARO) continued its very visible presence in July, impossible to miss for anyone working in Fairlie Poplar. 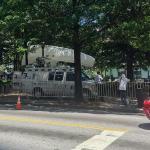 For a few days around the July 13th, however, the production moved slightly south from the historic district to Woodruff Park. Most recently, Avengers returned to Pinewood Atlanta Studios. Don’t expect to see any more of Robert Downey Jr., Benedict Cumberbatch, Tom Holland, Scarlett Johansson, Chris Pratt, (and so on . . . ) in Atlanta until the middle of August though. Damaged vehicles are among the scenery at the Avengers: Infinity War set in Fairlie Poplar. 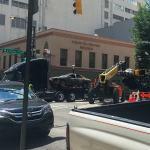 Crews move cars at the Avengers: Infinity War set in Fairlie Poplar. 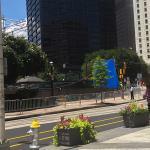 A blue screen was set up at the edge of Woodruff Park for Avengers: Infinity War. Prop vehicles line up around Woodruff Park during Avengers: Infinity War filming. The one Avenger you might still spot, however, is Thor. Chris Hemsworth’s Asgardian superhero is picking up a few shots for Thor: Ragnarok (CR). Signs were spotted near Pinewood on July 8 and again on the 18th. On the 20th, filming took place near Senoia. New this month, the CW is filming a reboot of the 1980s primetime soap opera, Dynasty (CROSS EYE). Starring Grant Show, Nathalie Kelley, Elizabeth Gillies, and James Mackay, the series tells the story of two of America’s wealthiest families, their children, their fortunes, and the inevitable feud that comes with obscene amounts of money. Dynasty actually shot a pilot in Atlanta back in April. Now that the series has been greenlit, the rest of the episodes are being produced here in town. We first saw Dynasty on July 19—a basecamp was spotted on Bolton Road near Atlanta Mission. The next day, crews were near Atlantic Station. On July 24, signs were plopped in Norcross, and on the 25th, in Suwanee. Clint Eastwood is shooting a new film in Atlanta, The 15:17 to Paris (KIKI). The film is based on The 15:17 to Paris: The Trust Story of a Terrorist, a Train, and Three American Heroes, an autobiography written by Jeffrey E. Stern, Spencer Stone, Anthony, Sandler, and Alek Skarlatos about their experience during the 2015 Thalys train attack. Interestingly enough, Eastwood has cast Sadler, Skarlatos, and Stone to play themselves in the film. Judy Greer and Jenna Fischer will also join the cast. On July 7, we saw KIKI signs in Sandy Springs. Between the 9th and the 10th, there was a basecamp at the Weber School off of Roswell Road. On July 12, another basecamp was spotted off Memorial Drive in Decatur. Additional filming took place on the 14th in southwest Atlanta, and at Benjamin E. Mays High School on July 18. AMC’s Halt and Catch Fire (HCF) just wrapped its final season in Atlanta. We’re sad to see this critically-acclaimed series go, but glad that it stayed with us for all four seasons. HCF signs appeared on July 5 in Norcross, on the 7th at the Infinite Energy Center, and on the 21st on North Druid Hills Road. Tag (S&K), starring Annabelle Wallis, Leslie Bibb, Isla Fisher, Jon Hamm, Jeremy Renner, and Rashida Jones, continued to film this month. The comedy finished up June in John’s Creek, near The Country Club of the South. On July 7, it was reported that Jeremy Renner fractured his right elbow and left wrist during a stunt on this project. He told Variety, “That’s how it goes. 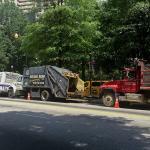 It’s part of the job.” Crews continued to work, moving to Stone Mountain Park on July 16. Additional signs were spotted in Tyrone on the 19th, and in Fayetteville on the 20th. 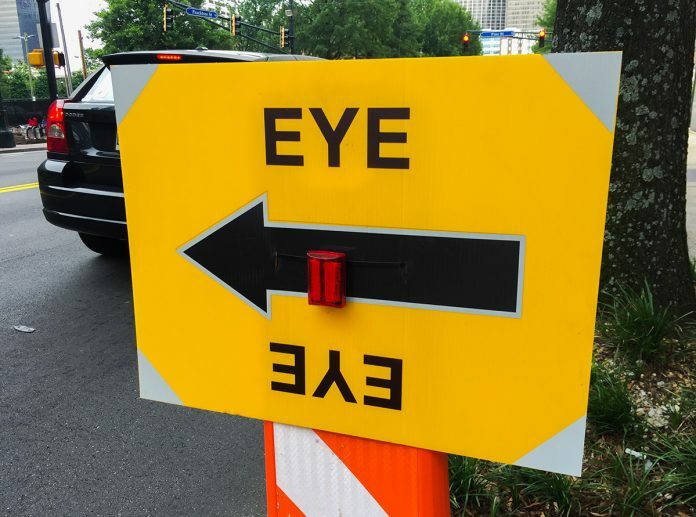 MacGyver (EYE) is back in town to shoot its second season. The CBS series was spotted in Buford on July 9. Crews worked in Lawrenceville on July 15. Most recently, filming took place on Main Street in Forest Park on the 20th. Also seen this month, Amy Adams’ Sharp Objects (SO) was in McDonough on July 5. FOX’s Star (SOS), now shooting its second season, filmed at the Gold Room on the 19th, and in Douglasville on the 25th. Godzilla: King of the Monsters (FATHOM), starring Millie Bobby Brown of Strangers Things fame, had signs in east Atlanta near Moreland Avenue on July 12. The Walking Dead (SF) shot in Griffin on the 18th. Rampage (R-19), now wrapped, worked in Doraville on the 3rd, and in Midtown on July 16. 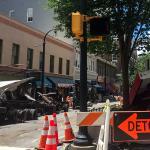 Step Up: High Water (SUP) filmed downtown on July 9. The next day, signs were placed in the Lindbergh area on Piedmont Road. Finally this month, we’re coming off the heels of San Diego Comic-Con, the culmination of all things pop-culture and nerdy. Most importantly, what that means for us is a cornucopia of new trailers for Georgia-filmed projects, including The Walking Dead, The Gifted (the production is moving here from Dallas), Stranger Things, and Thor: Ragnarok. We’re excited that all of these high-profile productions will have that “Made in Georgia” peach at the end.